Canal Fields is the main park in Berkhamsted and is maintained by Dacorum Borough Council. It is an attractive green space, centrally located between the High Street and Berkhamsted railway station, with a picnic area, skate park and a well equipped play area. 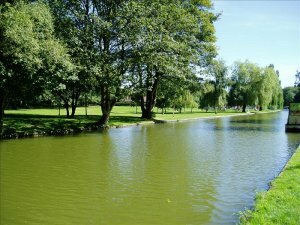 The park also benefits from the presence of the River Bulbourne, the Grand Union Canal and Berkhamsted Bowls Club. Parking is available, with access from Broadwater. The park has achieved the Green Flag Award, the national standard for parks and open spaces in England and Wales, 6 times since 2007.